Where Have All the Vikings Gone? 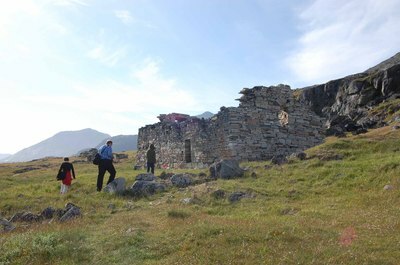 On Friday, the day after our accidental trip to Narsaq, we were able to arrange a private tour to take us to the Hvalsey Church ruins. This time, it was just the three of us, a guide, and the boat captain. It was nice to go without other tourists, so we could take it at our own pace. 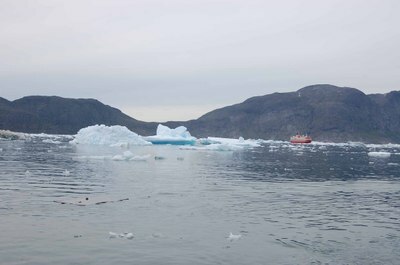 We sped down the fjord on Captain Karl's small boat, along with our guide, Susannah. It was a clear, sunny afternoon, and there was little ice in our path. 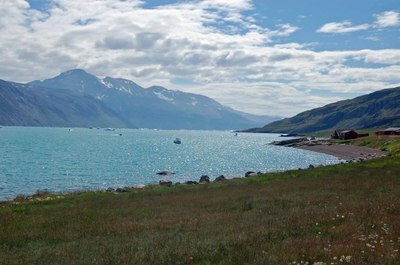 The water turned from deep blue to turquoise as we got further down the fjord, closer to the ruins. 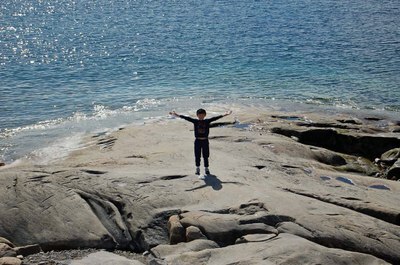 At the site, there is a small wooden dock, where we debarked easily. When we arrived, there was noone else around except for a number of sheep grazing on the hillside that had wandered over from a nearby farm. Small white and yellow wildflowers dotted the landscape. 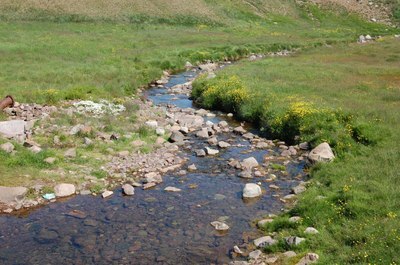 It was a beautiful, pastoral scene, with the lush green and golden grasses rimmed by the blue-green water and the dramatic granite mountains rising overhead. I could see why the early settlers would be attracted to the place and want to live in such a setting. 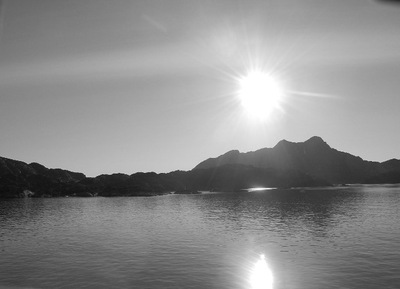 I had read that the weather was milder further up the fjords, and during the normal weather cycles, somewhat similar to Norway. 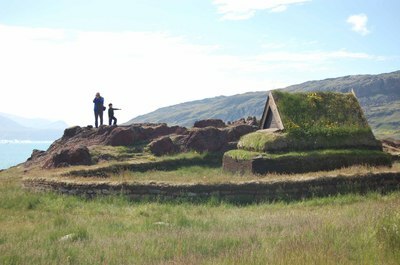 We hiked aong a narrow path to the ruins of a Norse church. Most of the structure is still standing, even though it is over 1,000 years old. 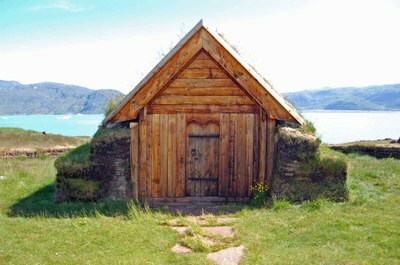 Erik the Red first led settlers to Greenland in the year 987, and at one point, about 5,000 settlers lived among the fjords of southern and western Greenland. By 1450, they had disappeared and the farmsteads were completely abandoned. All that remains are stone ruins of churches, barns, and homes. 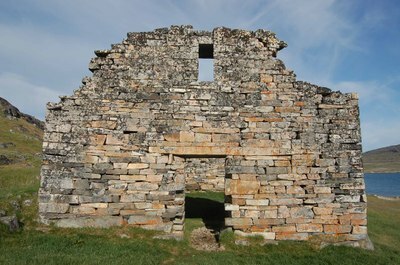 The Hvalsey Church is one of the most complete, and stands much the way the later explorers found it in the 1800s. The only thing missing is the turn roof, although Susannah explained that one of the walls had been rebuilt for safety after it started to lean. Susannah explained to us that the granite in the surrounding hills has the amazing property of breaking off on smooth, flat planes, and at 90 degree angles. This made making "bricks" of the rocks fairly easy, even with primitive tools. The settlers used ground mussel shells to make a mortar paste to hold the bricks together. It looked pieced together like a giant unfinished jigsaw puzzle. Luckily, the area is not prone to earthquakes, because I doubt this building would pass inspection in California. 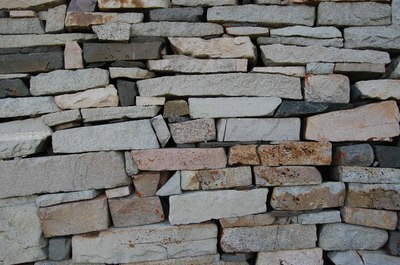 Usually, the walls of buildings were made from these granite bricks. 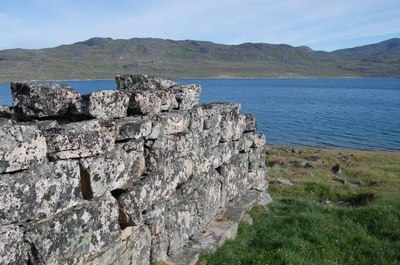 There are no native trees in Greenland due to the extremes of the climate, so any wood had to be brought in from Norway, or occasional but dangerous trips to "Markland" (Labrador, Canada). 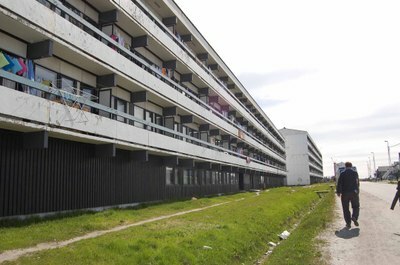 The roof was covered with cut-outs of the turf, which insulated the building from the cold in winter. Unfortunately, dirt and sod erode over time, so all that is standing now are the brick walls. Nearby, there is a large rectangular trench with more crudely crafted bricks around. Susannah told us that this was the church hall, where social gatherings would take place. A smaller rectangle between the two was the evidently the barn, where the priests kept their sheep and cows. Even though there are no native sheep, goats or cows, all of these domestic farm animals were introduced and raised by the Viking settlers. In the center of the complex of ruins stands a marker with an explanation of the site. I walked up to read the marker with Susannah. A large ram was laying on the grass next to it. Only when I got right next to it did I realize that the animal was dead. It must have died recently, because it had not decayed or started to smell bad. 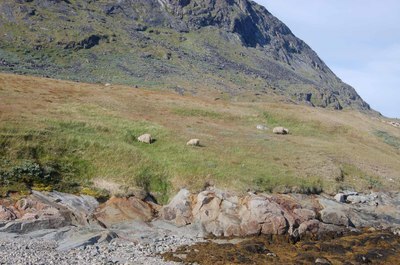 It was a bit disconcerting to see this dead sheep lying on the ground, and I was worried about how Alex would take it. He has refused to eat lamb chops in the past because as he says, "Mom, I don't eat nature." I'm not sure Alex noticed the dead ram. If he did, it didn't register with him or scare him. He did, however, ask me a few times when we were going to see any real, live Vikings. I guess he was expecting something like a Viking Colonial Williamsburg, where people would be dressed in costumes and pillaging villages when they were not milking cows. I told him that this was where they lived, but they had been gone for a long, long time. I think he was envisioning some guys in bearskin clothing with horned helmets running up to greet us at the site, so he was a little disappointed. He amused himself by finding rocks with quartz in them that glistened in the sun, along with some blue mussel shells at the water's edge. Susannah said, "Your boy has a lot of energy, but is a very focused little being. I like that." Susannah told us that she once had a tour group of Swedish Vikings come to visit, led by an archaeologist. 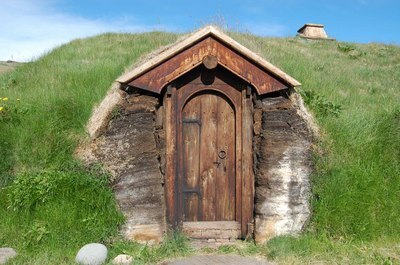 They wore Viking costumes and had swords and metal tools that they had forged themselves. They wanted to test their theories on how the Vikings lived, and see whether the tools they made would actually work. She said it was a little embarassing to be walking around town with a group of Viking re-creators. I think Alex would have loved that, especially the part with the swords. There is something very moving about looking at ruins of ancient civilizations. We've been to Leptis Magna, Pompeii, Stonehenge, Maltese temples, and other historic sites, and I always feel as though the stones are embedded with secret stories of the past. The thought that human hands helped to shape the structures for dwelling or for worship, puts us in touch with what we all have in common, both the need to survive and the yearning to understand the unknown and unknowab le. After an hour of snapping pictures and taking in the scenery, we head back across the water in Captain Karl's boat. 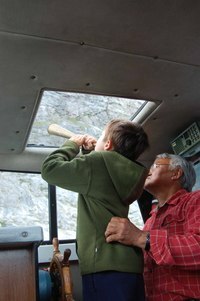 He stopped at some bird cliffs and got out a brass horn, opened the hatch, and tooted the horn. The white birds left their rocky perches and circled overhead, against the blue sky. Alex took a turn with the horn, and was delighted at the sight. There was something magical in that moment of looking out from the boat at the sky with the birds circling, hovering and diving overhead. 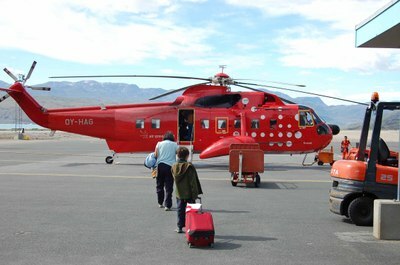 This was one of the most memorable days of our trip to Greenland. 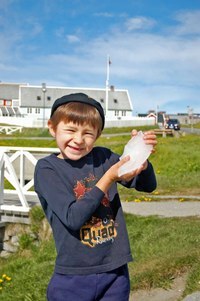 How Do You Pronounce "Qaqortoq"? 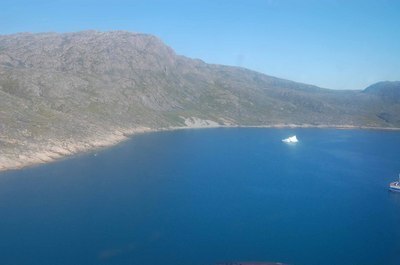 We landed in Qaqortoq, in the far southeast corner of Greenland, on July 4. The only indicator that we had that it was a holiday in the US was that one of the cashiers on the ship wished us a Happy Fourth of July at breakfast. Otherwise, we sort of forgot about it. 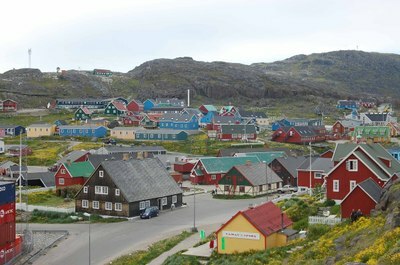 Qaqortoq has a population of about 3,000 people and most of the houses are set along a a ziz-zag of roads up a granite hillside. It's a picturesque place, with colorful wooden houses, wooden fishing boats in the harbor, and beautiful views of the bay set out at its feet. 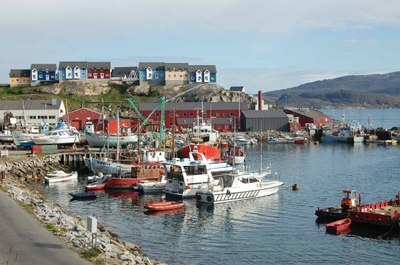 The town boasts a small museum, a tourist office, a couple of restaurants, grocery stores, and a few bars as well. 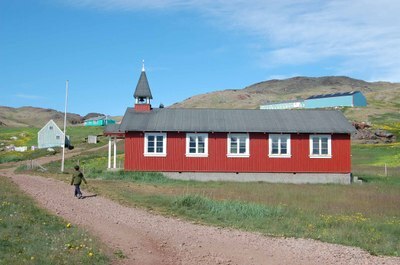 We were later told that there were several secondary and trade schools in the town, so young people came from all over Greenland to be educated there. Frank had read that there were Norse ruins nearby, so we decided to check it out for a few days. 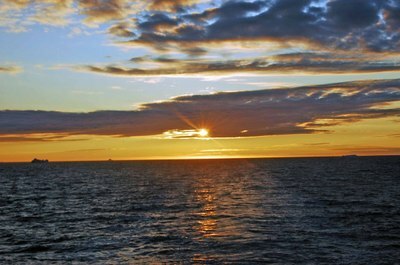 We arrived after three days at sea, and stood on the dock on our wobbly sea legs, scratching our heads. There was no one from the hotel to greet us, so we were a bit at a loss for what to do. We saw a few taxis whiz by and pick up large family groups and take off up the mountain. Frank went out to scout the scene. 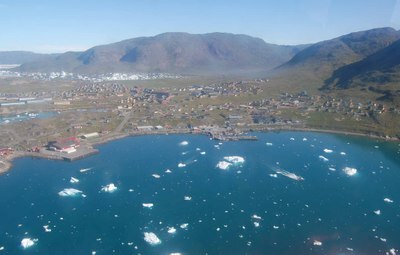 I had met a friendly Greenlandic woman on the ship who asked me if I was Greenlandic, and exclaimed, "You look just like my sister!" Frank saw her at the dock and asked her what we should do. She pointed over his head at the top of the mountain to a bright blue building, and said, "That's the hotel. Just get a taxi to take you up. You can share mine." 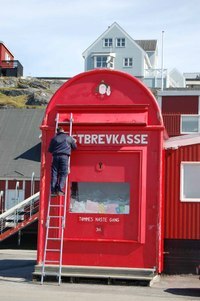 Frank came back to collect us and our bags, and the next thing we knew, my Greenlandic sister was speeding off in the only available cab. We sat on our luggage and waited a while, and eventually, another taxi came down the hill and took us up. The driver didn't speak English, but I said, "Hotel?" and he nodded and took us straight up to the hotel. I guess it helped that there is only one tourist hotel in town. 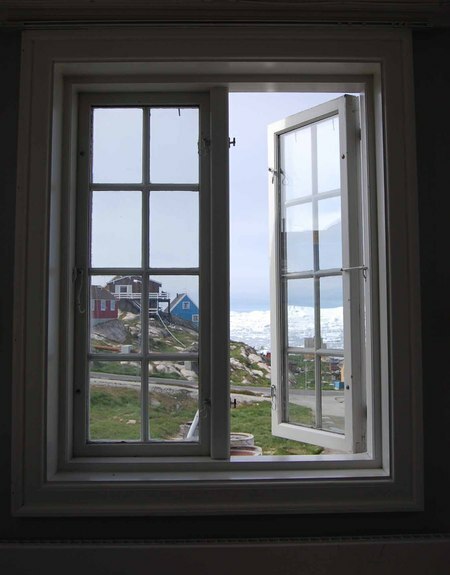 The Hotel Qaqortoq is a two-story building perched on the side of a cliff overlooking the bay. There is a steep staircase leading up to it from the main street, and a series of winding roads going up as well. There is no way we could have dragged all of our suitcases up that far, but a taxi only took about 2 minutes to get us there. The hotel is manned by two young Danish people, a man and a woman who look to be in their twenties and have identical spiky blonde hairdos that reminded me of Tintin. They were friendly and proficient in English. The girl Tintin had us wait in the lobby and made coffee for us while our room was being made up. We had been told that the family who ran the hotel had a 7 year old, and made the mistake of telling Alex in advance. He demanded to know where said 7 year old was hiding. We were told that they were no longer there, and that no one under the age of 50 (aside from us) was currently staying in the hotel. The TinTin desk clerk did tell us that the big group was leaving the next day, so there might be kids coming tomorrow. 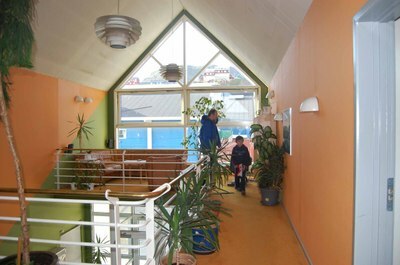 The hotel had a pleasant reception area and lounge, a pub, and a restaurant downstairs, with all the sleeping rooms upstairs. 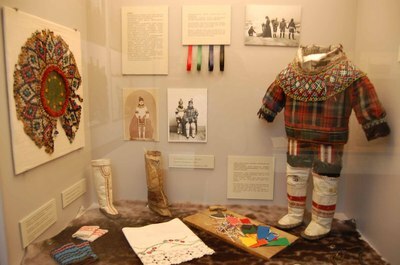 The walls are painted bright colors, with some sealskins stretched on wooden dowels hanging on the walls. The decor blended Scandinavian and Arctic motifs in an interesting way. The room itself was fairly small, and appointed like a college dorm room, with spare Ikea-style furnishings, two twin beds and a mattress on the floor for Alex. Luckily, there was a large closet where we could store our luggage. It was not a terribly comfortable situation, but there was a TV that worked, so Alex flopped down on the mattress to look for some Danish cartoons he could watch. 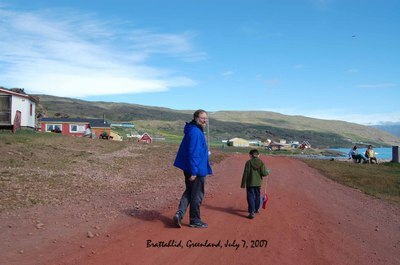 Frank and Alex decided to take a walk down to the tourist office at the bottom of the hill to confirm our excursion for the next day to the Norse ruins. 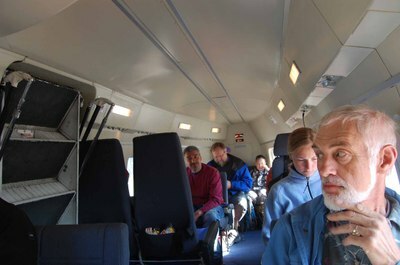 Frank came back and said we were all set for an 8 am departure, and we hoped that it would get dark enough for us to fall asleep by 11 or 12. He picked up a brochure about an art project in town called "Stone and Man" in which a group of Scandinavian and local artists carved designs and scultures into the granite hillsides and in boulders they found about town. We decided to look for some of them as we walked down the hill to dinner. 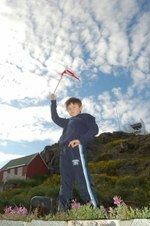 Alex had purchased a flag of Greenland at the tourist shop, and for the rest of the trip, he carried it around like a pint-sized Greenlandic explorer looking for lands to claim. 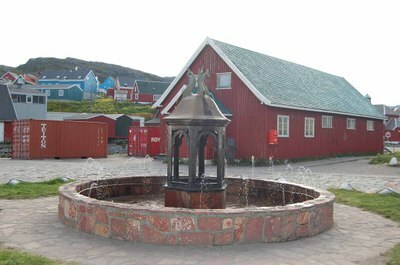 We walked down to the town square, which features the first working fountain in all of Greenland (according to the guidebook). It was a cute, small fountain with a dolphin motif in the middle of the town square, not exactly the Trevi Fountain, but hey, you have to start somewhere. We couldn't get into the Restaurant Napparsivik, billed to be the best restaurant in town, because they were booked up for the night with a tour group. Evidently, the King of Sweden was in town, and the town was abuzz with the visiting dignitaries who were there to study the glaciers and the impact of global warming. We weren't sure, but we decided that we were probably getting the boot in favor of the King. Instead, we went to the fast-food Grille Baren across the street and had pizza, which delighted Alex to no end. 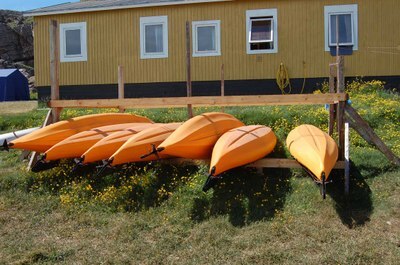 When we told people we were going to Qaqortoq, we would pronouce it "Kar-ka-tuck". They would invariably correct us and say "no, it's cchhah-ka-tocchh" with the "q" pronouced in the back of the throat, like you're about to hock up a lugey or clear your tonsils of popcorn debris. The closest we could get to pronoucing it right was saying it like the "ch" in the Hebrew words "l'chaim" or maybe "chanukah". 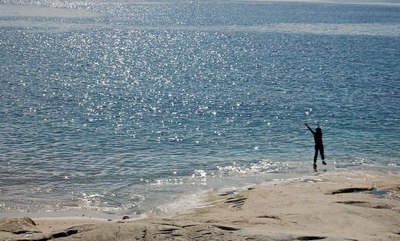 By the end of our three days in Qaqortoq, we were pronoucing it like natives.